I was listening to a podcast this morning where Jonathan Haidt was interviewed. He’s a very interesting guy and I recommend checking out some of his work, but he was there to talk about his new book that he co-authored called The Coddling of America. It is something that is commonly talking about as a university professor, and of course it is a pretty mainstream discussion as well. Helicopter parenting and the hand-holding that still takes place even as they enter college is somewhat alarming. He argues that the changes in attitudes of university students on campus started around 2013 and so his discussion isn’t about millennials but rather about iGen or GenZ. He talks about the fact that we have this generation that is raised where an adult is constantly around. Also the constant testing and homework means kids don’t play enough and when they do play it is always under adult supervision. Kids don’t learn conflict resolution strategies when an adult is always a mediator. There was far more detail that he gave but what primarily caught my attention is his explanation of why this is. I mean if these young people are actually having moral panics and creating obstacles in their life that don’t actually exist, it is the fault of the parents and how they are raised. So he asks the question, why are we pre-disposed as parents to coddling? It seems a weird byproduct of a safer world, but from the discussion it seems that what we are doing is inventing or exaggerating fears because we don’t have as many as we used to. So I thought I would ask some questions for purposes of discussion. Does this hypothesis seem reasonable and fit what you’ve observed in society? What sort of shift would you like to see happen, and how do we go about making that change? Are we all just old fuddy duddys who don’t get the younger generation? Well the strike of faculty in the Pennsylvania State System of higher education ended after 3 days of class. Given that I had a couple of blog posts leading up to the post I thought it might be useful to sum up. Before I get into the details of the agreement I thought I would start with some more personal observations. I have never been on strike before and I found the experience interesting. I think it was initially just odd because I think we all expected a last minute agreement. It was also an odd feeling that I then became a truant, somebody who wasn’t fulfilling his contractual duty and for all intents and purposes didn’t have a job. On the picket line we stand outside the university grounds and it was weird to get locked out of any access to campus systems as if we were just another person who didn’t work or attend the university. I understand how it goes, but it feels a bit cold for a place that you’ve invested the last 14 years of your life in. On the picket line the feeling was definitely more positive. There were so many students who supported us. They honked their horns, came and stood with us on the picket line, and delivered snacks and water. I really can’t express how much strength it gave all of us to see the student support. We also had some support from grade school teachers who had recently gone through strikes of their own who lent support. I really thought you would just be standing their on the picket line and then would have to walk to the closest fast food place in order to get lunch. I’m pretty sure I gained weight on the picket line with all the food that was brought to us.. So how did it all end? Well I am happy to say we won. Well sort of. For those who believe that it was about the money for faculty I think we more than effectively proved them wrong. After going an entire year without a new contract and losing the normal small increase in salary we usually get to keep pace with inflation, our final deal revealed very little salary increase and most of it was negated by health care cost increases. We did reduce some of the deductibles slightly as the increased health care costs really impacted those faculty who themselves or their family have health problems. I am happy to say that we did effectively eliminate all items from the table that reduced academic quality that I talked about in my previous post. We also made sure adjuncts were treated fairly. The biggest downside to it all is that the contract was short term. It was only a 3 year contract, retroactive to when the last one expired. So this contract will expire in May of 2018 and we’ll have to go through negotiations again. Ultimately it’s disheartening how much the state wanted to degrade quality education for the purpose of money. It seems apparent that they know the truth: that faculty really care about their students and educational quality and they can keep trying to degrade that and force us to take it on the chin in terms of salary. Our increase in salary was half of what other state unions were able to get. For most other unions it is just about salary and benefits, but our contract contains a lot of things that impact educational quality which can be used as leverage to keep salary increases low. In a normal world, one might expect new contracts to contain things that enhance educational quality not weaken it. With the way education is being attacked in this country I am thankful that I am in a union and that other educators have unions as well. I naively thought it was kind of a silly thing when I started out. It didn’t occur to me that such a large portion of society wouldn’t see it as important to always invest in and make better, as opposed to running it like a for profit business. Currently the state schools in PA get appropriations that cover only about 25-30% of their costs. To me this isn’t public higher education, this is a private school system with some state subsidies. 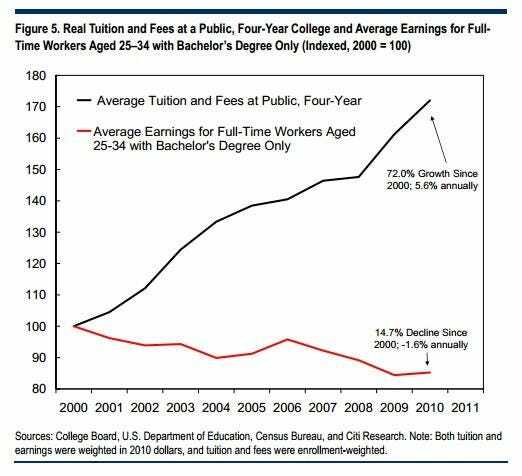 No wonder tuition costs continue to rise. I suspect this strike is just one of many future battles we’ll be facing, and I’m ready to keep fighting. Here is my theme for the strike as I was the PR person and was hounded by reporters at times and “could not be everywhere at once”. 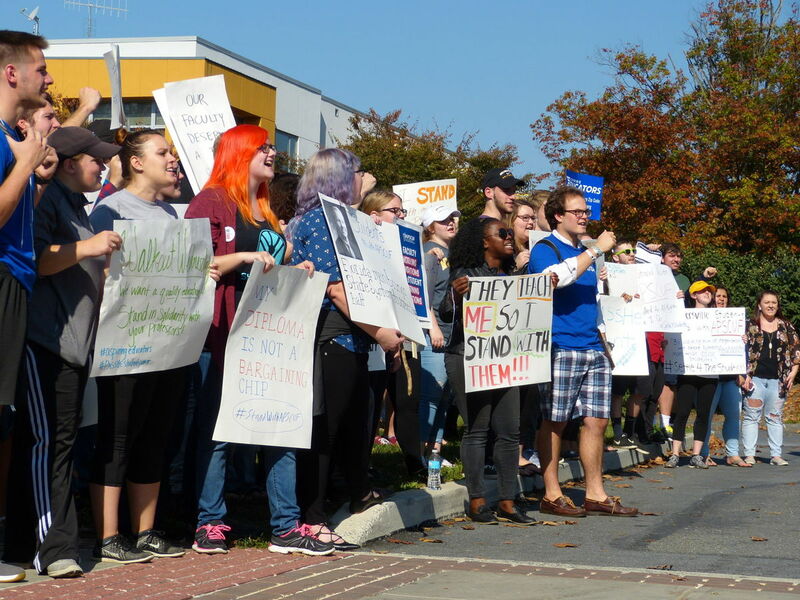 There have been numerous articles now posted in local papers about the upcoming possibility of a state system of higher education strike in Pennsylvania. And with that comes comments. It has been unsettling to see the amount of ire towards educators. I know there are a lot of conservative people in PA. In a way PA is probably a good microcosm for the general breakdown of the country in Republican vs. Democrat. There is a thread in attitude by the critics of the strike and I just wanted to briefly talk about it. I don’t know what to do about it, but it does make me sad. There is of course general ignorance towards the problem. Nobody really understands what educators go through on a daily basis, but apparently we can all easily be replaced with more qualified people at a lower cost. For most people it’s all about the bottom line. Dollars and cents. Critics don’t think of whether or not changes to our contract might not cause the quality of education to suffer, we are simply greedy people who want more money and don’t care about our students. taking away all of our money. Anti-union sentiments are strong. I never really thought much about unions and their value. I know unions can become corrupt. Anything can become corrupt. Churches, government, business. But overall I’ve noticed that when there are no unions, workers are taken advantage of more strongly. This country has a history of workers not being treated fairly and humanely. Unions have helped us rise out of that situation. They have brought us child labor laws and helped workers make living wages. And while there are plenty of examples where workers are treated well without a union, by and large this isn’t always the case. Some companies have no need to form unions, others I think it is very important. Our union is unique because our contract also contains important elements to educational quality. Investing in education pays off, but when we treat it like a business and we don’t invest in that business, the quality suffers. Education itself may need reform, but the answer isn’t to reduce quality. Let’s look at what research demonstrates as effective pedagogy and make that happen in our schools. Let’s make education truly affordable again. Let’s not bring each other down, and focus on the true cause of our suffering. People on welfare aren’t my enemy. People who have lost their jobs, their benefits, who have had to take pay cuts aren’t my enemy. I would support you every step of the way for you to improve your quality of life, and be treated fairly by your employer. I’m not your enemy either. I’m in the middle income tier in PA, as are many other professors. Your teachers on average are in an even worse place financially. The middle class continues to get thinner and it’s not good for our country. There should be common ground between democrats and republicans to work together to build the middle class. Weakening education and tearing middle class people down, doesn’t seem to be the answer. I love university. From the very first moment I started as a student, I thought it was great. The buildings, old and new, housing different academic fields, knowing there were extremely knowledgeable people who were dedicating their entire lives to those fields and passing on that knowledge to students. I was nervous my first day. University, I think no matter how small a university you go to, it feels big. Big ideas, a campus much bigger than your high school and anxiety filled visions of getting lost, looking stupid, and feeling small run through our minds. By the end of the first year I realized I was in love. I felt that after 1 year of university I had learned as much as I did my entire time in high school. I was exposed to diverse groups of people, diverse sets of ideas, and could literally feel my mind and my values growing. Now I know my experience is not everybody’s. It’s not everybody’s calling to devote themselves to this institution we call university, but by my junior year I knew it was my calling. Society is made up of many different parts, and I believe that universities play an important role. Whether a student pursues an Associate or Bachelor degree, or chooses to specialize more deeply in their area of interest through a graduate program, the character and knowledge they bring into their new roles in the “real world”, as a result of their education, is important. We live now in a nation where universities are under attack. Education is becoming increasingly undervalued. Yet history clearly demonstrates that when societies make education a priority, it promotes greater innovation and economic growth, empowers people with knowledge as an antidote against oppression, and gives us the ability to flex our minds and adapt in an ever changing and increasingly technological world. The most current attack on universities in this nation is in the Pennsylvania State System of Higher Education (PASSHE). If a new contract isn’t agreed upon between the faculty union and the state system by Oct. 19th, the faculty at 14 universities across the state will go on strike. This has the ability to cause great disruption to the education of our students and because the state system is trying to spread the message that our striking is out of selfishness and desire for money, and a betrayal to the students we say we care about, I wanted to take a little time to explain why we’re striking and why it matters. An increase in workload for full-time adjunct faculty. Adjunct faculty are an important part of a university because as faculty retire or move on, as programs grow, we need quality adjuncts to fill teaching roles. When we get good ones and the position becomes permanent and tenure track, it is an easy transition for that faculty in their new role as a permanent professor. By increasing their workload to 5 classes (a lot by any university standards) and reducing their pay by 20% the probability of attracting quality adjunct faculty is reduced. In addition their increased workload will have negative impacts on the quality of teaching and thus the student is not served well. The state also wants to significantly reduce the pay for part time adjunct faculty as well. Increased reliance on adjunct faculty. Ultimately adjunct faculty would like a job with more security as we all would. Adjunct faculty are only there to teach and generally play no other role in the university. They don’t advise students, they don’t serve on committees or are required to do university service. And why should they? They don’t have the same protections as tenure-track faculty and can be let go at any time. The state wants to increase the cap on the percentage of adjunct faculty at each state university. Coupled with the last point, this means less quality teaching. It means that since adjunct faculty are often looking for more permanent work, this will result in universities constantly utilizing less experienced lecturers who have never taught courses before. Any student who has taken a class from a first time teacher for a course, you know it’s not as good as it could be. Increased workload for those supervising internships, supervising student teachers, and teaching lab courses. Any time there is a numbers increase on supervision, the time with each student is less. Good supervisors do a lot of work and it is a very helpful role. The increases in workload for internship supervision is by 67% and for supervising student teachers 20%. The most egregious one for me is the reduced value of lab courses. This is a difficult one to explain, but basically one hour of lab used to count as one contact hour, but now they want to reduce it to 2/3rd of a contact hour. Faculty in the state system are required to teach 24 contact hours an academic year. So those who teach lab courses will have a greater workload even though labs have grading, and take time to prepare just as much as a lecture. This will also discourage faculty from offering lab courses. Lab courses are part of important hands-on experiences. They are usually in smaller settings too, where students have more interaction with their professor. Increased hands-on experience in the classroom is proven in research studies to be an important part of quality teaching. So why doesn’t the state system want that? Because if I am teaching a 3 credit course with 3 lab sections, I have 6 contact hours for a 3 credit hour course. A regular lecture course with no lab is 3 credits and 3 contact hours. So if I teach labs I teach less credit hours. You, as a student, pay by credit hours. You are a dollar sign to them, and nothing more. They don’t care how well you are taught, or what research demonstrates about effective teaching practices. It’s about how much money they can make. This is what’s happening all across the U.S. in public higher education. Allowing administration to move faculty to different departments to teach different courses. Did you ever have a teacher in high school teach you a subject that wasn’t their specialty? It happens in middle schools and high schools all the time. Have the PE teacher, teach a history class, have the biology teacher, teach a couple of math classes. This could happen at university now as well, where teachers who didn’t specialize in a particular area are forced to teach outside their area of expertise. How much would you expect to learn or enjoy such a class? So you might say this is a pretty one sided discussion what about money. Clearly faculty want more money right? So let’s talk about that a little. Well who wouldn’t like more money? But keep in mind we have already been without a contract for almost a year and a half and have been on a salary freeze. We would also like to be treated with similar salary increases as the state has offered other unions in the state. We would like our salaries to keep pace with inflation. Who doesn’t want that? However, if you talk to any of your faculty, you’ll probably find that they care less about that, than impacts on their work quality, and the quality of education they can provide you. To show you how committed the faculty are to improving education, recently the state system tried to offer faculty more money to their salary to try and have us ignore all the measures they are taking to reduce educational quality. * The union refused to sign a contract based solely on a salary increase, and refused to be pitted against adjunct faculty. Health care costs are also currently a point of contention. There are many unions who have had to take a hit in increased health care costs. How far we will get in regards to this issue remains to be seen, but we do believe that quality health care should be something provided by employers and changes proposed by the state system would incur additional costs in range of thousands of dollars to faculty. We have taken smaller hits in the past which have essentially negated salary increases. This year, most faculty expect a similar result and don’t expect more net salary given the increased health care costs we are likely to incur. The mission of PASSHE is to provide the highest quality education at the lowest possible cost to students. The problems that we face in higher education in this country are perhaps broader than just what we are facing here, but if tuition costs are not going down and quality continues to get lowered something about the system is broken. We have less direct say in these larger problems, but we can be advocates for the quality of education you receive as a student. Thus, I felt it was important for students to know that your faculty do care about you. We don’t see you as a customer or a dollar sign. We see ourselves as people who play a role in your future, and thus the future of the region, the state, and the nation, and we feel the quality of education you get is important. We are tired of decisions being made about teaching dictated from a group of people who haven’t spent any time in the classroom. If you are concerned about the strike, you and your family need to send an e-mail to the university president at the university you attend. You need to contact Chancellor Frank Brogan (Chancellor@passhe.edu). You need to write your local state congress representatives. We faculty, still hold hope that a strike will not be necessary, and if it happens a strike is no holiday to us. I’ll be just off the California University of Pennsylvania campus, on the picket line, every day, hoping sooner than later, I will get to walk back on the campus and give students the quality education they deserve. You may not agree with our taking a stand on these issues, and that’s okay, but I hope you can respect my right to see this as important, and I hope that you all will take a stand for whatever you truly care about in your futures as well. *Note: The article that discusses the offer made to faculty to increase their salary, states that our average salary for faculty is over $100,000. This is untrue. Salaries at public universities are publicly available. Here you can find all salaries of all employees in the university system. You can export this data to excel. I calculated the average salaries from cell B270 to B6315 (which is almost all faculty) and came up with an average of just under $80,000. A big difference from what PASSHE is saying. The data is from 2013, but represents the contract we are currently under. On Friday, at my university, we were fortunate enough to have a very well know climate science researcher speak, Michael Mann. IF the name sounds familiar it’s because he was the one that produced the famous “Hockey Stick” graph that appeared in the peer-reviewed Geophysical Research Letters journal in 1999 (I wonder how many graphs have their own Wikipedia page!). The graph of course was much maligned by climate change deniers funded by various lobbying groups, but has since that time proven to be quite accurate and verified by other researchers. His was also among the e-mails leaked in the scandal called “climategate” which, despite the spin of deniers from out of context e-mail excerpts, has been debunked by the scientific community. It was a great opportunity to hear from someone who has been at the heart of promoting scientific research on climate change, while also dealing with a great deal of political controversy and pseudo-science promoters who try to claim human-induced climate change is a hoax. Like many climate scientists he has reached a point where he no longer finds it very useful to reach out to the public with facts and figures. Numerous research articles have concluded that now, views on climate change are governed by political ideology rather than directly arguing with the science behind human-induced climate change. I found the talk quite illuminating since I too have reached the same conclusion that scientific evidence seems to carry little weight when having discussions with people about the issue. I also found it illuminating to learn more about the political state of affairs in the U.S. right now, so I wanted to share some good news and bad news takeaways for those of you concerned about our Earth. One thing that I thought was a good take away is that if you are a person debating or discussing this topic with a friend, relative, stranger whatever, that talking about the scientific consensus is probably the most helpful thing you can do. Obviously there are always going to be contrary people, but for many there is still a misconception that this is a split issue, and research demonstrates that a lot of minds are changed by pointing out how much consensus there really is. For more conservatively minded people reminding them that there are more economic benefits to doing something to not doing something, and that climate change also represents a national security issue is also important. Fortunately there is already a faction of the military addressing climate change from this perspective. The other bit of good news is that there is a great deal of plans in place by scientists and engineers to start dealing with climate change. Basically the scientific community is prepared, and are simply waiting for the political will to be able to spring into action. Michael Mann also said there are a lot of Republican members of congress who are closeted climate change supporters. They accept the scientific evidence and feel that it is important to do something about it. Why are they in the closet, well they have learned the lesson of Bob Inglis. He was a SC congressman who served from 2005-2011 and came out for doing something about climate change from an evangelical Christian perspective. He said the scientists were right and as Christians we should be caring for God’s creation. If you are a Christian this is a valid position to take and is supported by scripture. Bob Inglis ended up losing by a landslide in the Republican primary as his opponent was support by the Koch brothers. Michael Mann and Bob Inglis are good friends and so I believe this political inside information to be plausible and valid. In some ways by releasing him like that, conservative America has opened up a can of worms and Mr. Inglis now promotes doing something about climate change from both a Republican and Christian viewpoint. Well the bad news is also related to the good news. 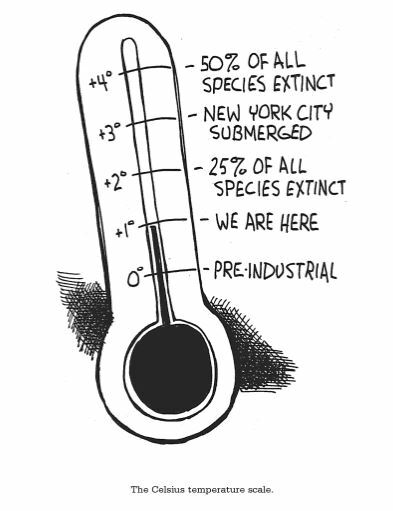 It makes me concerned, not only that the massive money of the Koch Brothers and energy companies lobbying against solid science is preventing us from taking action that will help this planet, but also that we have so many Republican people in congress without the political courage to stand up to the money. It seems if they all banded together I am not sure what the likes of the Koch Brothers could do, if all of a sudden all of those people in congress lost their next elections suddenly. It would sort of “show their hand”. I guess it upsets me that the people we elect can be so intellectually dishonest and live with themselves. I asked Michael Mann what the political tipping point would be to make all these Republican congress people come out the proverbial closet. He said that it would take the Republican party to crash and burn in this next election. Only by losing the executive branch and the senate (and possibly the house) would make them turn around and start to support more environmental concerns. The problem is that this election is looking a lot closer than it should be. A small margin of victory by Clinton isn’t going to cut it. What is clear is that whatever your political stance, climate change is in your best interest and it behooves you to vote for politicians who do have the courage to fight for this planet. Given Gary Johnson, and Trump’s stance on climate, these are really not viable options. And most importantly make sure you vote for people in the senate and the house who accept the scientific consensus on climate change as well. Finally I also want to help promote Michael Mann’s new book. It gives a much more in depth discussion than my little summary here. He also teamed up with a satirical cartoonist from the Washington Post who provides some good humor throughout the book. 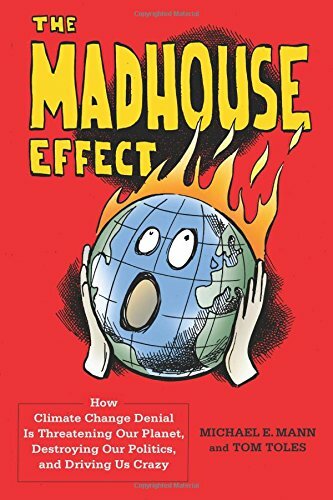 The book address things like ethics, politics, the money and ideologies behind climate science deniers, logical fallacies, and of course some basics about the science. I highly recommend it. The book discusses tipping point in the climate system which are points which there is no quick return from and can lead to rapid disaster. One of Bernie Sanders big talking points during his Primary campaign run is free college tuition and public colleges and institutions. Something so grand is easy to get behind and while I in principle support equality in access to education I think it’s worth looking at a little more carefully in terms of costs and benefits. A couple of years ago The Atlantic published an article that showed that the cost to giving free public higher education in the U.S. would cost $62.6 billion dollars. Now this is tuition alone, it may not include some student fees, and does not include room and board which can also be a big expense for parents. Nobody could argue though that life would get a lot easier for families or those students only having to pay living costs. So where should this money come from. We could, as a society, just decide to pay for it. It would be roughly $630 a year for the average taxpayer (approx. 100 million taxpayers in the U.S.), which means the average person’s taxes would increase to a little over $50 a month. While I could certainly afford something like that, I don’t think everyone could, nor would such a tax increase go over well. Now Bernie Sanders has a plan to get that $75 billion through a Wall Street speculation tax. There seems to be some disagreement as to whether this is a good or bad thing, but even if he was able to cut college tuition costs by half this might be a good thing. Of course the tuition costs are only one of the things he wants to change. He wants to stop the government from profiting off of student loans, and he also wants to allow students to be able to refinance their loans at lower interest rates. Overall I would say that he wants to make some sensible changes. Educating your people is an investment, one that pays off, and you don’t need to profit off their loans as well. Thomas Jefferson believed that an educated public was one of the most important parts of having a successful democracy and he is quite right. So there is some big support for making college accessible to everyone. My biggest concern though is that free tuition doesn’t necessarily support this aim, and so much larger shift needs to happen. With free tuition my hope is that universities will shift away from the expectation of simply producing job ready individuals. My hope is that we can allow many more students who simply want to go through and learn more about philosophy, the humanities, ethics, and how science works. More of that liberal arts centered education which has shown to be very beneficial in the market place even if it doesn’t directly seem to qualify one for a particular job. With public higher education not being run under a business model anymore, then perhaps we can shift away from students being seen as products that have to yield immediate results or a directly translatable degree to a job. My university actually has a degree in Professional Golf Management. Yes I still can’t believe this is a thing. I’m not saying that such people don’t need to be educated, but the fact that you need to create a specific degree to do that job seems surprising. As a professor it is clear to me there are many students who don’t want to be there. I don’t see free tuition as the thing that sparks students into working hard to learn and become better people. Now may be classes could become more fun when everything isn’t so outcome based as it must be in order to meet certain performance indicators for funding, but in order for college to be of the most use to us as society several other things need to happen. The first is K-12 reform in also getting away from a business model through those compulsory years. By promoting critical thinking better, students may be able to handle college better. I feel a lot of problems I see with students today are a result of being raised in a school system that focuses on rote memorization of facts and testing, over critical thinking skills. A system in which getting the grade is more important than how you get there. We also need to promote the value of education in general. Perhaps it’s a bit of a chicken and egg since running schools like a business tends to put people in the mindset that knowledge is only valuable when it is directly applicable to a job, but we all need to be better in promoting how a broader knowledge base has benefits beyond just our job, since being in a democracy and being part of a pluralistic society requires us to be multidimensional in the knowledge we are proficient in. We also need to stop promoting college education as the be all and end all of being valuable in society. In many countries with free tuition students much choose a track at the age of 16 as to whether they want to go to college or take a vocational track and learn a trade. And while I don’t want to shut students off so early to the possibility of going to college, trade skills are of such an important value to society that it makes me sad here that we still are under this paradigm that everybody should go to college to be valuable in a society. I do think free tuition a higher education institutions is not necessarily a right. I do think it is a privilege. A privilege that I think our country can afford. And I think free tuition allows university to maintain higher levels of academic rigor. Currently universities don’t want you to fail people, pushes you to graduate students to keep numbers higher, to make it look like your program or universities has a high graduation rate, all because it brings in more students and brings in more funding. So I think free or lower cost tuitions gives more institutions freedom to keep standards high and thus those that do graduate are of a higher quality. Of course there are even more secondary positive impacts. More informed voters should lead to more responsible politicians, and less government waste. The last episode of Jon Oliver’s Last Week Tonight was an excellent example how making the decision to eliminate lead from homes would actually be a benefit instead of a cost in the long run. We need voters who not only understand issues but understand economics well enough to realize good investments from bad. Then there is also the stimulation to the economy as many more graduates who would no longer be burdened by massive student loan debt would be able to spend more. People complain about the idea of free tuition, often because they say they don’t want to pay for someone else’s education. But you already pay a lot more for people’s ignorance. You pay a lot more because our generation of college graduates are deeply in debt and can’t spend money. You pay a lot when our best and brightest can’t go to college and only our richest can. 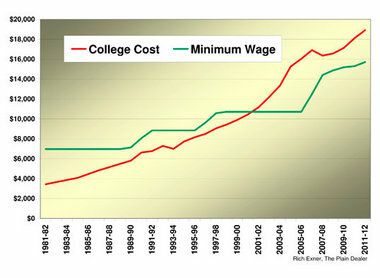 You pay a lot more when someone remains in poverty instead of being able to get out of it through a college degree. Whether you feel like tuition should be free or not, the problem remains. Students are in massive debt. College tuition prices have increased faster than wages, and we are no longer able to give an equal opportunity to students who want to get college degrees. Something has to change.